My nephew loves this character so much that he was one day very persistent that I take a Lightning McQueen picture in my style! 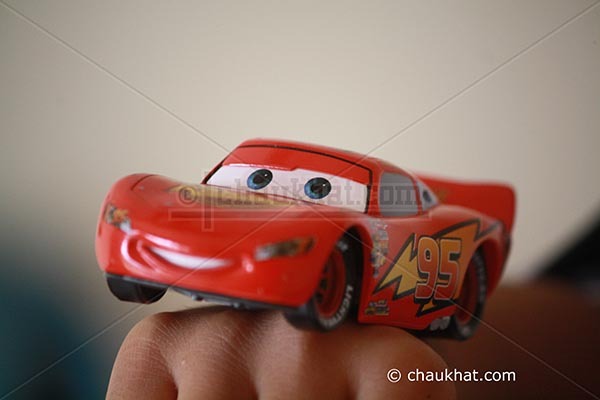 So I thought for an idea for a while and told him to fold his palm in punch style; I then put the car on his hand and took this "Lightning McQueen Picture". He liked it very much! The picture really turned out to be of good quality for me too. Usually I'm a bit choosy about ranking pictures. But this turned out to be good in my view also. Why? It's because the photo has soft focus to cover the kid subject. Additionally, the crispest focus point is on the eyes of the car. Secondarily additionally, the light is nicely spread and natural. Gosto desta foto , esta muito engraçada. Tenho pena de saber por o tradutor a funcionar , pois queria responder-te ao coméntario no meu blog , mas assim nâo percebi o querias dizer. My nephew is crazy about this character too! I have gifted him so many pictures, stickers, bags! Can I take a print of this picture for him? No meu outro blog" Na Lua" é so musica que eu gosto mas nâo tenho coméntarios.